Clayton Samuel King is a multi-media artist that works predominantly with acrylic paint. When creating his work, he will apply different techniques that help expand his knowledge of artistic expression. The common themes in his work relate to his Indigenous cultural background that is highly influenced by the Professional Native Indian Artist Incorporated, 3 generations of Woodland School artists and the sublime of nature. 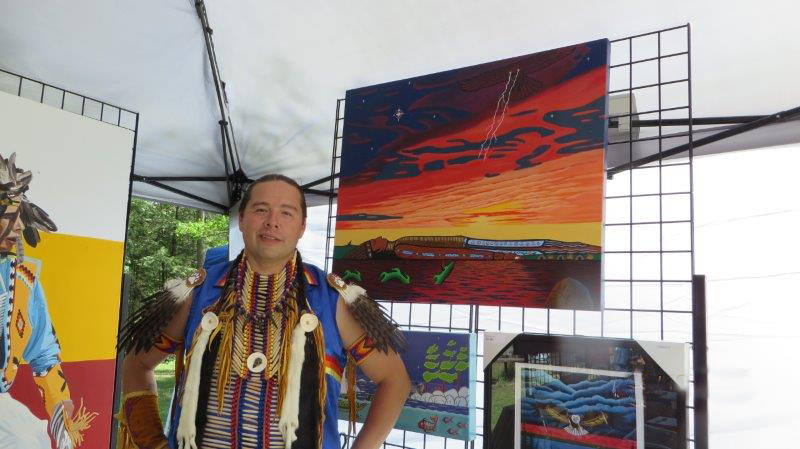 He does his best to interpret the knowledge that has been bestowed upon him to help sustain Anishinaabek culture and history through several artistic practices. He has recently been working and experimenting with visible and invisible ultra violet luminescent paint. Working in the dark is different, but the advantage of this new media has helped him heighten the spectral and metaphysical aesthetic he wants to produce to the viewer. This medium is new to the Woodland Art Style and it is a medium that Clayton will continue to use in the future. Nation/Chippewa Tri-Council and the Simcoe County area in the 1800’s. My business idea has helped and will continue to help the people as it has acted as a bridge to understanding First Nations culture, spirituality and history to indigenous and non-indigenous people alike. I do believe that since beginning on this path I have helped create an understanding of reconciliation through my art and instructional practice.